Historically, human beings are far from the most reliable species. They do things like wait three days to text you back, and shave their armpits. They're temperamental as hell. It's honestly safe to assume we might be better off if we opted for a society organized by mammals who don't use iPhone apps to find love -- like, say, penguins. Lucky for you, if you're ready to commit to a life sans homo sapiens, there is, in fact, a solution: You can purchase an entire landmass called Pebble Island, located in the Falkland Islands, populated by not one but five species of penguin. And the current owner wants you to name your price. 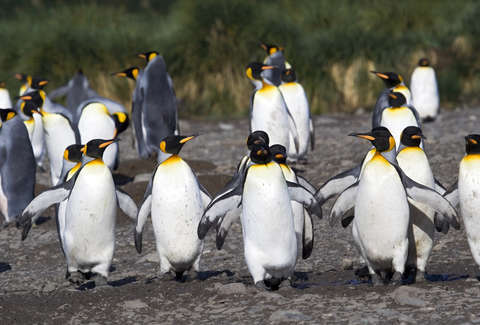 The island is 20 miles long and four miles wide, and in addition to the plethora of penguins, the place is also home to 42 species of bird, 125 cattle, 6,000 sheep, and a legion of sea lions, according to the BBC. That is to say, there's no diversity problem. Currently, Pebble Island is under the jurisdiction of Sam Harris, the great-great grandson of its original buyer, John Markham Dean, who purchased the land mass eons ago in 1869 for the equivalent of $505. To be clear, this means he literally bought an entire island for half the monthly rent most of us pay to live in glorified walk-in closets. According to Harris, the place is actually rife with tourism potential. Not only is it a brilliant microcosm of biodiversity (again, 42 species of bird), but it also offers the potential for profit in the wool business (don't forget the part about the 6,000 sheep). It's fair to assume Harris won't draw the line at $505, but if you think you've got a convincing offer, now's your chance. Cash is, of course, preferred, but if you also have 17 rare species of cricket, or an enormous wooden ark to barter, those things are certainly worth addressing.